Dr. Ray Windsor, former many things!! When I flew from the USA to Singapore in June 1967, I had no idea how the Spirit would surprise me. Within 24 hours of arrival, Theodore Williams (then MC leader and chair of WEA) and David Howard (then head of WEA) met me for lunch and before I could eat a bite, I was asked to move into MC leadership. I had no idea what that meant, and the job description unfolded by Theo and Dave as I scratched notes on the paper place mat of the Novotel Orchid Inn restaurant. They ate; I did not. I had no idea what I was getting into, but four men soon profoundly shaped me, all older than I. Theo of India, Stanley Davies of the UK mission movement, Wade Coggins of the US EFMA, and Ray Windsor. 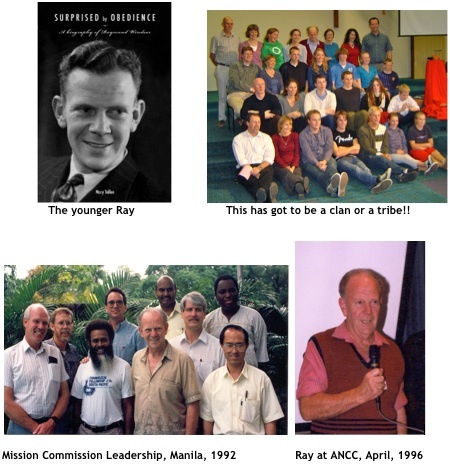 I will never forget Ray saying to me, “Bill, if in any way I can help you, please let me know.” He traveled indefatigably for the MC, especially doing early research on “emerging missions” training of missionaries. That led to our first consultation under my leadership in Manila, 1989 on that very subject. Sadly, Ray’s heart acted up that week and we kept him updated while he lay in bed. He actually repeated that act at a missionary training consultation in the dead of freezing winter in the mountains of Argentina in 1991. I had been deeply moved by his decision to leave the leadership of ANCC in order to return home to care for aging parents. What an example! Yvonne and I were privileged to visit New Zealand a number of times, to be hosted by him and his lovely wife, Gwen (Gwendolene), a remarkable woman, mother, grandmother, and a lover of beautiful flowers. The last MC event Ray attended was held at All Nations Christian College in 1994, when we addressed the missionary attrition issues. He was 66 at the time. We well remember that he played the piano for us, and said his farewell to the MC. The picture of him above was taken at that time. The last time I spoke with my beloved friend was during the 2005 visit that Yvonne and I made to New Zealand. The four of us had driven up to the northern end of the North Island for some days of true rest, and conversation, and marvels of the beauty of that nation. Our last Sunday in Auckland, he drove to hear me preach at an Anglican church and we had a last interaction. We had seen what Parkinson’s was doing to him. He said to me, "Bill, for years you have taught about finishing well. That's what I have purposed to do." I wept as I said farewell, because I intuitively sensed it would be the last time, this side. I quote from the report coming from the MC partner in New Zealand, Mission Interlink, and their gracious words on a great man. Many people spend much of their life trying to work out what their gifting or talent may be. Not so Ray, he had plenty to choose from. He was an accomplished classical pianist and could easily have forged a glittering career making the most of this gift. He was a talented sportsman and played in Wellington College’s First X1 cricket team and First XV rugby side. Then he pursued a career in medicine which in turn led to him training as a heart surgeon, working with pioneers such as Sir Douglas Robb and Sir Brian Barratt-Boyes. He served as a heart surgeon at Greenlane Hospital for three years. But Ray didn’t follow his own giftings, he followed God’s call on his life and became a missionary. For Ray and wife Gwen, “trust and obey” is the cornerstone of their faith. They went to India to work with the Bible and Medical Missionary Fellowship (now known as Interserve). Mary Tallon, in her biography of Ray, describes his work in the field of medical mission, how he was a pioneer of both medicine as mission and the tentmaker approach to mission work which these days we take for granted. Ray married Gwen in 1953. Nine years later, with 5 children under 8 years old, they headed to India, commissioned by Mt Albert Baptist Church (which was built by Gwen’s grandfather). They spent the next 20 years serving the people of India in various capacities. Ray was instrumental in establishing an association of evangelical Christian Hospitals in North India called Emmanuel Hospital Association (EHA). Today EHA has 20 hospitals and 30 community health and development projects in 14 Indian states with a staff of about 1500 plus 156 doctors. Ray ended up as International Director of BMMF before accepting a call to be principal of All Nations Christian College in the UK. Then the couple returned home to look after Ray’s ailing mother, Janet, because Ray had made a promise to his father to do so, and because he took seriously the command in 1 Timothy 5:3-8 about providing for relatives and immediate family. But Ray continued to serve the missions community through the World Evangelical Alliance and the WEA Missions Commission. Ray also served on several boards including The Bible College of NZ, TEAR Fund and Operation Mobilisation. The Funeral is 1:pm at The Windsor’s long-time home church, Mt Albert Baptist on Monday the 15th. In lieu of flowers there will be an account set up for donations.